The part was originally written with Tom Hanks in mind as Jerry Maguire. Luke Wilson was the early favorite to play Frank Cushman, but when Cruise was cast, he looked a little to similar to Tom and the role ultimately went to Jerry O’Connell. Others considered for the role of Dorothy include Connie Britton, Mira Sorvino, Bridget Fonda, Marisa Tomei, Patricia Arquette, Cameron Diaz and Winona Ryder. Legendary director Billy Wilder turned down the role of Maguire’s mentor agent, Dicky Fox. Crowe would end up writing “Conversations with Wilder” with Billy later. Jay Mohr read for Matt Cushman and Todd the Nanny before being cast in the pivotal role of Bob Sugar. Rolling Stone publisher Jann Wenner makes a cameo as Scully, the head of SMI. Musician Glenn Frey (The Eagles) plays Dennis Wilburn of the Arizona Cardinals. Shortly before the movie’s release, Detroit Lions head coach Wayne Fontes was fired. His brief role was not cut from the final edit of the film. Among the other athletes and sports figures appearing as themselves in this film are Al Michaels, Frank Gifford, Ki-Jana Carter, Katarina Witt, Drew Bledsoe, Jeffrey Lurie and Troy Aikman. Other cameos include, director Mark Pellington (Arlington Road), Alice in Chain’s Jerry Cantrell, Lucy Liu and Cameron’s mom, Alice. Paula Abdul helped Cuba Gooding Jr. choreograph his touchdown dance. Agents (Gary Wichard, Leigh Sternberg, Drew Rosenhaus), NFL players (Tim McDonald, Drew Bledsoe) and NFL Owner Jim Irsay were just a few of the people that Cameron spent time with during the research phase of the film. But Jerry Maguire and Bob Sugar are pure fictional characters. The “Show Me The Money” line was inspired by then Arizona Cardinal cornerback, Tim McDonald. 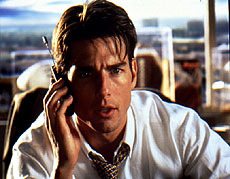 There were actually special effects done for Jerry Maguire by Banned From the Ranch. You can read about it here. Originally a fictional Reebok advertisement was shot by Reebok for inclusion at the end of the film over the closing credits. Cameron decided not to include the commercial, which features Cuba Gooding Jr. as athlete Rod Tidwell, in the theatrical version but the commercial was reinstated for initial viewings on Showtime. The commercial can be seen as an extra feature on the DVD and Blu-ray.